Ozzy Osbourne has released a new plush toy to mark the 37th anniversary of his infamous bat-biting incident during a concert in Des Moines, IA. 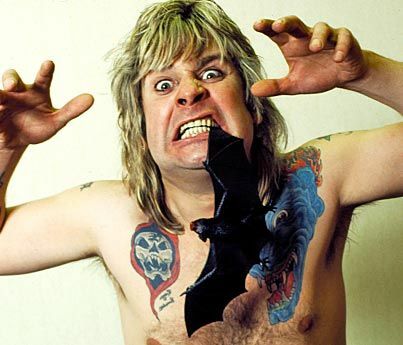 During a January 20, 1982 show at the Veterans Memorial Auditorium in the US Midwest city while on tour in support of his second album, “Diary Of A Madman”, a fan threw a bat on stage and the singer famously bit the animal’s head off. “…from out of the audience came this bat,” he wrote. “Obviously a toy, I thought. So I held it up the lights and bared my teeth while (guitarist) Randy (Rhoads) played one of his solos. The crowd went mental. Then I did what I always did when we got a rubber toy on stage. CHOMP. “Immediately, though, something felt wrong. Very wrong. For a start, my mouth was instantly full of this warm, gloopy liquid, with the worst aftertaste you could ever imagine. I could feel it staining my teeth and running down my chin. Then the head in my mouth twitched. Oh f**k me, I thought. I didn’t just go and eat a f***king bat, did I? The 12” tall Ozzy Osbourne Plush Bat – with a velcro detachable head – is a web exclusive and available at the rocker’s online store here. Following a New Year’s Eve edition of Ozzfest at The Forum in Los Angeles, CA, Osbourne will resume his No More Tours 2 world trek – with guests Judas Priest – in Dublin, Ireland on January 30.